In the pursuit of affluent living, people have brushed aside greater riches---the Environment. We, at Three-S, wish to preserve this beautiful environment that is the source of all life. We seek to keep up our passion for delivering environmentally low-impact products in order to pass on the wonderful global environment to the next generation. Ecology starts with home care. Home is an everyday space and something that people come into contact with all the time. As such, we are dedicated to developing and using coatings that are safe for and gentle with people. Eco-friendly and easy to take care of---we safeguard long-lasting living spaces. 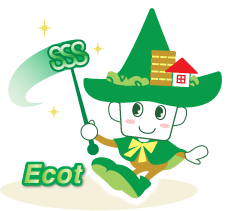 Ecot is a wizard specializing in residential coating. His motto is to be friendly to people, pets, and the environment. With a flick of his wand, he keeps houses beautiful. superior construction know-how and product appeal. Our hope is to maintain the beauty of the newly built residences. 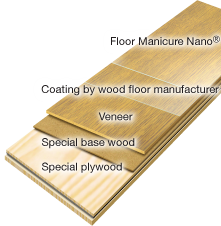 Floor Manicure Series features Japan’s top safety and durability. This water-soluble coating material has VOC values notably lower than comparative solvent counterparts and general commercial products. It does not contain any of the 13 substances, including formaldehyde, that are regulated via the Ministry of Health, Labor and Welfare Guidelines. With a very high safety grade of F**** or higher, Floor Manicure Series has been selected by 120,000 homes since our inauguration. depending on the flooring type and lights used. Copyright © 2012 Three-S Corporation. Co., Ltd. All Rights Reserved.